Signal. You can never get enough signal. Got full bars on your laptop? Something will come up, cause you to move, and then you'll be down to three, and then two, and before you know it your downloads will be failing and you'll be holding your device up and waving it around, hoping the fickle gods Micro and Wave will smile upon your plaintive dance while everyone else in the coffee shop sneers over mochas. You could avoid this scene with a BearExtender PC, a $45 device that will give you signal enough to curse them all and work out on the patio if you feel like it. Read on to see if it's worth it. We first heard of BearExtender back in January, when it released its n3 for Macs. 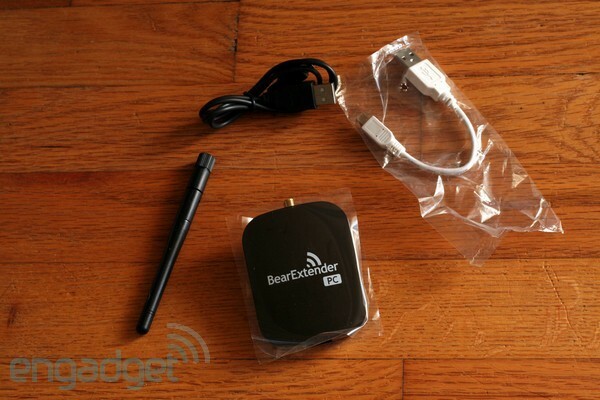 That $45 extender from Berkeley grad Roland Saekow impressed our friends at TUAW and seemed like a right old bargain for those who operate on the very edges of WiFi range. Now there's a PC version, aptly and cunningly titled BearExtender PC. It too is a $45 ($44.97 to be exact) 802.11n adapter and it looks much the same as its fruitier brethren. It's a reasonably small capsule, about the size of an Altoids tin but thinner and, naturally, proudly displaying a 2dBi gain antenna, which thankfully pivots and rotates in all sorts of directions. It has a miniUSB connector on the bottom, coming with two cables of differing lengths that you can select from depending on how far away from a host port this will be situated. On the back is a clip to attach it to your monitor, but that easily comes off if you're not feeling it. Installation is easy: there's a CD containing drivers for XP, Vista, and Windows 7, which take all of a minute to deploy. After that you plug the thing in to your next available USB port and wait for the little blue light to start blinking. Surf's up. The clip on the back of the device makes it easy to perch it atop an LCD, but of course when it's attached thusly the lid on your laptop won't latch. We could certainly see removing that altogether and using a little adhesive-backed Velcro to stick it onto your display instead, which sounds like a fun and simple DIY project. Unfortunately there's no getting around that USB cable. For testing we headed out into the wilds, the frigid and frozen wasteland that has become our back yard. With our trusty Linksys WRT54G in the basement next to the cable modem we get great signal inside, but in the summertime we're lucky if there's much left 60 feet from the house. Surprisingly, in the 20 degree F temperatures and humidity-free air we're seeing lately, signal range has seen something of a boost. 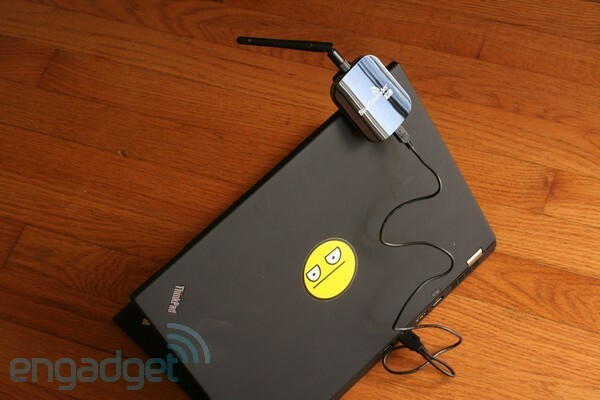 Using the standard internal WiFi adapter in a Lenovo T400s we were able to successfully maintain signal out to 180 feet -- though the strength started dropping noticeably after 60. At 240 feet we could no longer get a reliable connection, our attempts at testing bandwidth failing as often as not but delivering a poor .67MB/s download and .15MB/s upload when they did work. Fingers quickly going numb we ran back inside, disabled the laptop's adapter, attached the BearExtender PC, and blew on our hands for a bit while mumbling expletives about the virtues of testing WiFi range in the winter. Blood flow and feeling restored we headed out again. 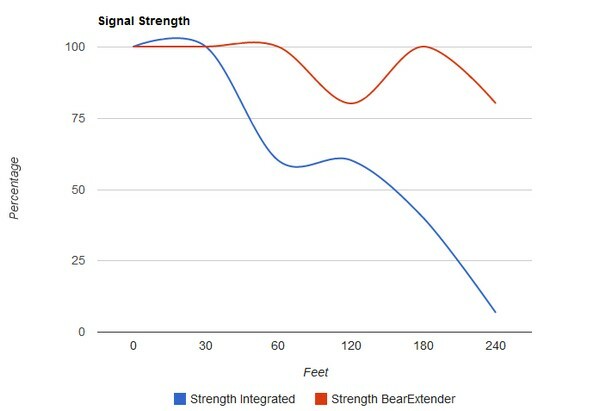 With the BearExtender, download and upload speeds stayed consistent all the way out to 240 feet, where signal strength was hovering between 80 and 100 percent. There was a slight drop in performance at 180 feet, but other than that hiccup performance didn't waver a bit until we ran out of yard and hand warmers. And this with a pedestrian b/g router! To put it simply: this thing works. At 240 feet, with a concrete wall between us and our 802.11b/g router, our laptop's integrated WiFi receiver gave up the ghost but the BearExtender PC felt like it was just getting warmed up. Yes, it's a little clunky and having yet another gadget hanging around is sometimes a bother, but at $45 this is great deal if you are cursed by low signal strength and just don't feel like dancing.